The second assistant director (also known as the second AD) serves directly under the first assistant director as his or her right-hand person. As a result, the main function of a second AD is to carry out the boss' orders and directives. Although careers in film and television are more prevalent, there also are opportunities for theater and stage assistant directors. Many second ADs are also responsible for finding extras or "background" actors for non-speaking parts. In some cases, however, third ADs or set production assistants may also help with this. 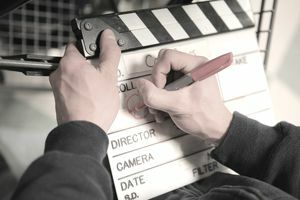 Second assistant directors usually serve as a liaison between the set and the production office, which is why they often might have duties similar to those of production staff. They often are responsible for briefing senior management on the status of a particular shoot. To be an effective second AD, in addition to excellent organizational and time-management skills, you must have exceptional interpersonal and communication skills. These communication skills are a must since you may be called to deliver briefings and status reports to senior management and decision-makers. Time-management skills also are essential, because you will likely need to coordinate logistics, arrangements and sketch detailed plans for the first AD's review. Interpersonal skills are a must-have. As a Second AD, you will interact with people in a number of different roles, from the lowest-level staff member to senior leadership. Your ability to adapt your communication and interpersonal relationship-building skills will not just benefit your career, but make your employer look good too. If you are detail-focused and have great organizational skills, you will do well in a Second AD role. It might seem like you are simply another pair of ears and eyes for the First AD. Pay attention and act almost as the First AD's shadow, and you will earn high marks for your performance, and possibly tangible rewards. After all, if you make the First AD look good, you look good as well. As with most productions, a second AD position is a freelance job. This is why the requirements for joining the Directors Guild of America often are specified according to days, instead of years, because of the nature and short tenure for freelance assignments. It is often long, grueling work that you must do with a smile on your face because if the first AD believes that you are only going through the motions without any real commitment, you might risk the chance to move up in the field. The best way to get work as a second AD is to start as a set production assistant or third AD. If you're a quick study, learning the ropes will be easy for you.